SHANGHAI—When top executives from the world's major auto makers descend on Detroit for the U.S.'s largest auto show next week, Chinese auto executive Wang Shunsheng will be attending a table-tennis tournament in Dubai sponsored by his company. "We're not going to Detroit this year," said Mr. Wang, head of international business at Guangzhou Automobile Group Motor Co., China's sixth largest auto maker. Entering the U.S. market "requires a lot of study and investigation and we're still in the process." 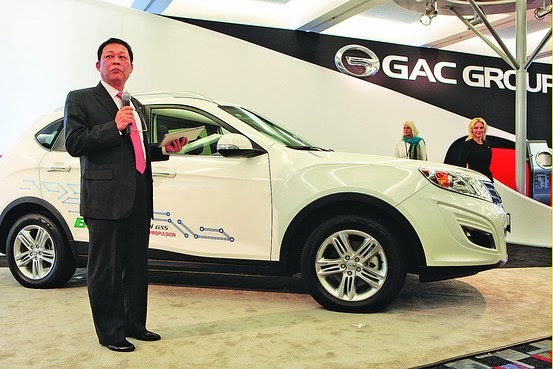 GAC Motor isn't the only Chinese auto company shunning this year's U.S. show. For the first time since Chinese auto maker Geely Automobile Holdings Ltd. debuted at the show in 2006, no Chinese car company will hold an exhibit this year. Stephen Dyer, partner at management consulting firm A.T. Kearney's Shanghai office, said North American and European auto markets still represent the "Holy Grail of validation" for Chinese auto makers. "After initial strides into mature markets several auto makers learned firsthand how difficult it is to penetrate from a regulatory standpoint, let alone having a competitive product," he said. One company that may next tackle the U.S. market is Chinese car maker BYD Co., in which billionaire Warren Buffett is a minority investor. Earlier this month, it outlined plans to bring around four models to the U.S. by the end of next year. BYD has made similar claims before. In 2010, the company said it would bring a pure electric model to America but later abandoned the idea due to the lack of a viable business case, Stella Li, senior vice president of BYD, said in an interview on Thursday. China's Qoros Automotive Co., a joint venture between China's Chery Automobile Co. and investment group Israel Corp., last year received a five-star score from Euro NCAP, a prominent European crash test, for its Qoros Sedan 3. It also won't attend the show. A spokesman said Qoros has no immediate plans to launch in the U.S.
Cracking the U.S. market requires robust dealership networks as well as products and brands that entice American consumers to buy. Generating volume sales typically demands having a strong local production base in North America nurtured by a mature supplier base. Bill Russo, president of auto consulting firm Synergistics Ltd., said establishing a U.S. market presence requires considerably deep pockets—something few privately owned Chinese companies have. Until the number of "subscale" Chinese auto companies is narrowed down it will be difficult for the Chinese to go truly international, he said. And while China's state-owned automotive companies have capital and tend to be profitable due to their lucrative joint ventures with global auto makers, they lack the drive of privately owned companies, he said. "I know no case of a company coming from a highly fragmented home market such as China succeeding at going global," he said. Great Wall Motor Co., one of China's most successful car companies, said it won't display at the show due to its company strategy. And Geely said the company is focusing on existing markets, but said it might someday consider the U.S. market again. State-owned car makers also are staying away. A spokeswoman for General Motors Co 's Chinese partner SAIC Motor Corp. said the company won't exhibit at the show because its marketing plan doesn't include North America. SAIC Motor is among Chinese car companies sending executives to visit the Detroit show for benchmarking or to attend events on the sidelines. One such gathering is organized by the automotive division of the China Council for the Promotion of International Trade. 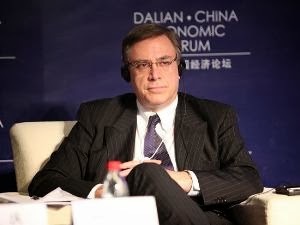 Paul Haelterman, vice president at IHS Automotive, said the Chinese had other near-term opportunities that were more attractive than the highly competitive U.S. market. They will place more priority on Latin America, Southeast Asia, Russia and even Africa before giving serious consideration to North America, he said. For GAC that means focusing on markets in the Middle East and South America. It sold only 550 cars overseas last year, its first year in the export arena. In 2014, it aims to grow that almost tenfold to 5,000 cars. In addition to being title sponsor of the International Table Tennis Federation World Tour, the company is also hoping to get an export lift from the on-screen debut of its Trumpchi model in this year's "Transformers 4" movie. Mr. Russo, the auto industry analyst, said eventually leading Chinese car makers will make it in America. "The best Chinese car companies are probably five years away, the others a decade," he said. BEIJING – Bill Russo, former president and CEO of Synergistics Ltd. in Hong Kong and vice president of Chrysler Northeast Asia, joined Harman International Industries, the premium global audio and infotainment group, as the company’s vice president of corporate development for Harman’s North East Asia & China operations, responsible for new business development, regional growth initiatives, strategy deployment and related communications, according to a company news release. Russo reports to David Jin, chairman and president of Harman North East Asia & China. He also reports to Sandra Rowland, vice president of corporate development and investor relations for Harman International. Russo will be based at Harman’s North East Asia headquarters in Shanghai, China. Russo had served as president and CEO of Synergistics Ltd., an Asia-based business development advisory firm, since March 2009. He served as vice president of Chrysler Group’s North East Asia business, where he directed operations for the regional markets from July 2004 to September 2008. He was director of product & business strategy at DaimlerChrysler from January 2000 to July 2004, senior manager of post-merger integration of DaimlerChrysler from May 1998 to December 1999, and senior manager of process management & continuous improvement at Chrysler Corp. from July 1993 to May 1998. Earlier in his career, he worked in the global services and technology divisions for IBM Corp. from July 1982 to June 1993.